The latest graphics card from manufacturer Galaxy is certainly a looker. 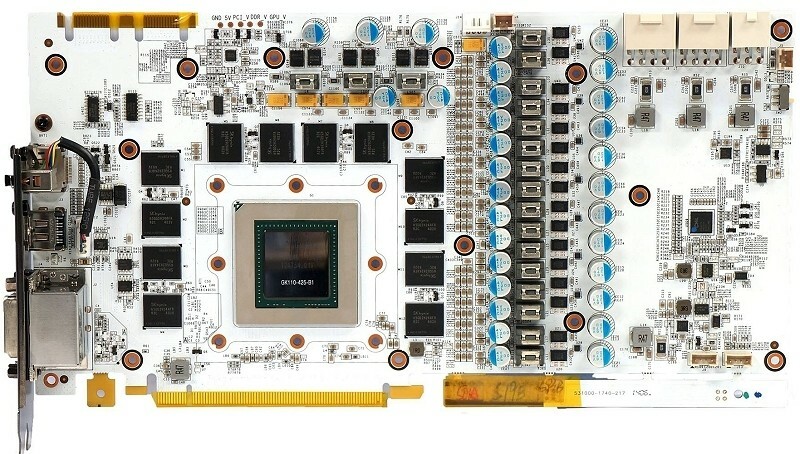 Known as the GeForce GTX 780 Ti Hall of Fame Edition, the card features a unique white PCB that immediately brings back memories of the white motherboards that Soyo put out more than a decade ago. The card recently set a new world record in 3DMark Fire Strike and Fire Strike Eagle (with the help of liquid nitrogen) that was no doubt possible in part due to the impressive power setup. The card features 16 phases for the core, two for the memory and three for the PLL. Elsewhere, the HOF edition uses high-end Panasonic tantalum capacitors, KEMET tantalum capacitors with a capacity of 330uF and MDU3606 MOSFETs from Magnachip. Aside from this, we don’t know too much else about the card at this hour. It will be overclocked but by how much remains unknown. Just for reference, the card that broke the world record was pushed to 1866MHz on the core and 2000MHz on the memory – or in other words, pretty darn fast. What’s more, we have no idea what the heatsink / cooler will look like. Odds are, much of that pretty PCB will be covered up by a giant cooler to keep temps under control. We do know that the memory will feature its own heatspreaders, however. No word just yet on when the card will be available for purchase or how much you can expect to shell out for the opportunity.